I have NEVER seen these prices before!! Incredible prices to Los Angeles. Prices are now under $700! Travel in Oct – Dec.
Click the links below to see all the flights. We have also provided some sample dates, click them and once the search has completed you can change the dates. 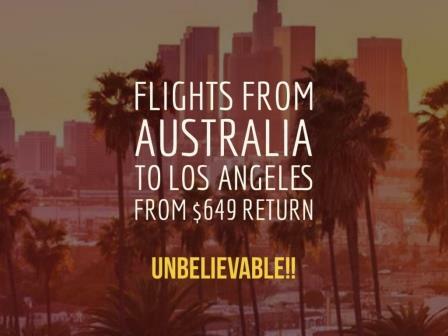 Brisbane to Los Angeles Flights $649 Return using Visa Credit Card. Flying Air Canada. Sydney to Los Angeles Flights $696 Return using Visa Credit Card. Flying American Airlines. Melbourne to Los Angeles Flights $721 Return using Visa Debit Card. $734 using CC. Flying United Airlines. Flights to Los Angeles – All Other Departure Cities. MEGA DEAL – $155 FLIGHTS TO BALI RETURN – 4 HOURS ONLY!